Do you have a treasure to lend to the new exhibit? In late November, a new exhibit showcasing the hamsah and the kippah will open in the Fisher Social Hall. Both contemporary and historical ones as well as other Judaica will be displayed. Do you have a treasure to lend for the exhibit? We are looking for beautiful pieces of interesting material and designs, perhaps from a special occasion or collected from far away. Please send a photograph and description to Jackie Saunders-Ritchie at jsaundersritchie@shaw.ca by November 5 and we’ll get back to you. Thanks, Jackie Saunders-Ritchie and Janna Ginsberg Bleviss. Posted on November 1, 2018 Categories Congregation Emanu-ElTags JudaicaLeave a comment on Do you have a treasure to lend to the new exhibit? The Simcha Gift Shop at Congregation Emanu-El has kippot, tallitot, mapot and many other Judaica items. The gift shop is located at Congregation Emanu-El at the southern end of the Social Hall. You may shop during office hours: Tues-Thurs 9:30-2:30 or by appointment by email. We accept cash, cheques, and credit cards. Come check us out! These Arbah Minim (‘Four Species’) are 4 plant species which are used ritually as part of the observance of the festival of Sukkot. Three of the species (the palm, willow and myrtle) are placed in a special plaited holder and collectively are known as a lulav; the fourth of the species, the fruit of the citron tree which is known in Hebrew as an etrog, is held together with the lulav. It is a mitzvah (commandment) to shake or wave the Four Species on each of the seven days of Sukkot, usually before or during the Morning Service. This shaking or waving of the Four Species is symbolic of the completion of the yearly cycle, of freedom, and of peace and harmony. We shake the lulav in every direction to indicate God’s presence throughout the world, while facing east towards Jerusalem. Because an etrog can easily be damaged and because certain kinds of damage cause it to become unacceptable for use as part of the Four Species on Sukkot, it is typically wrapped in protective layers and placed inside a box (אתרוג תיבת). 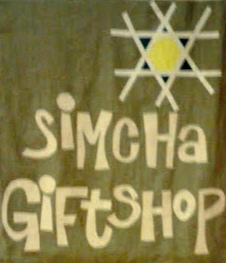 The Simcha Gift Shop at Congregation Emanu-El carries Havdalah sets and candles and many other Judaica items. The gift shop is located at Congregation Emanu-El at the southern end of the Social Hall.